It’s officially Fall, but a few warm days are lingering and I am fully embracing the transitional weather. Keeping in mind that temperatures are chilly in the morning and drop again at night, my outfits need to have just enough coverage to fend off the chill, but not too much to make warm afternoons uncomfortable. 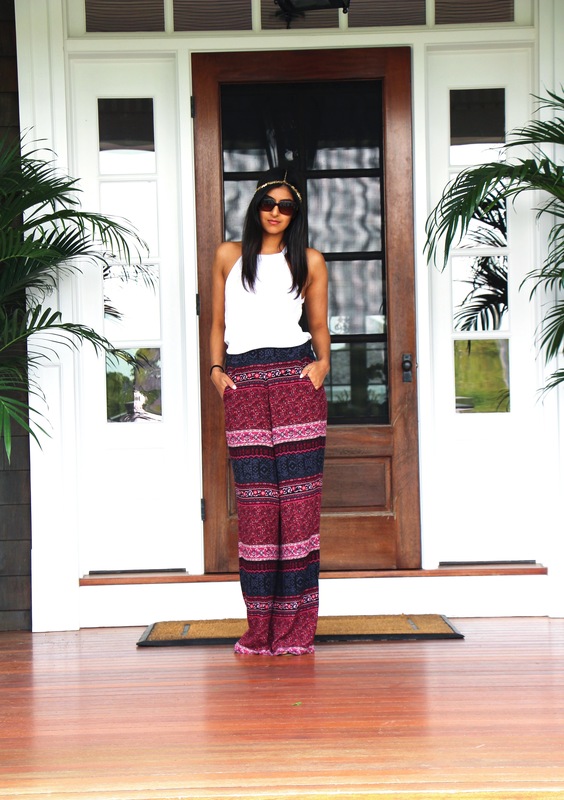 The first piece of clothing that came to mind were palazzo pants, which will be a trend throughout the fall. 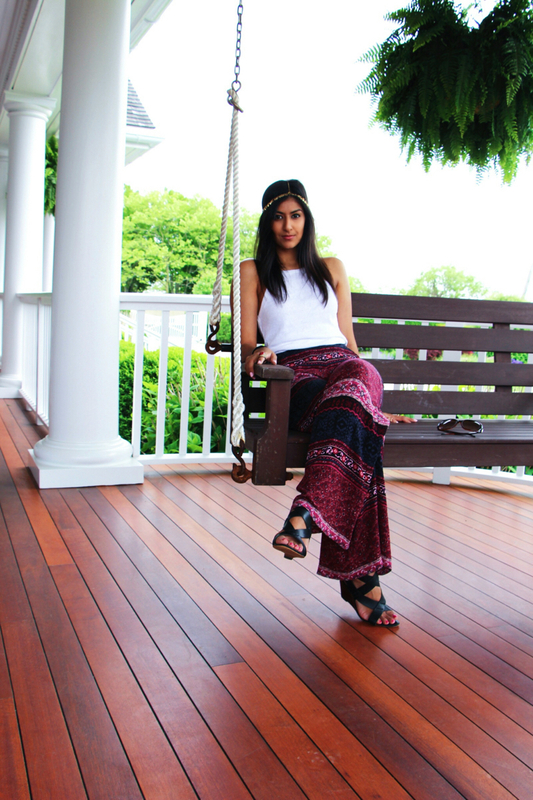 Palazzo pants have a great boho look, and I love opportunities to channel my roots with the Indian flair as well. I wanted my overall look to make a statement while being simple and laidback, allowing me to go from morning coffee on the terrace swings to strolling around town to dinner with friends. I paired these palazzo pants with a multi-crossback white top that was casual enough for the daytime and playful enough for the evening. To maintain the boho style, I threw on a black fringe bag that could hold my all-day essentials. Staying in a three-hue color theme, I wore black strappy wedges and burgundy shades. 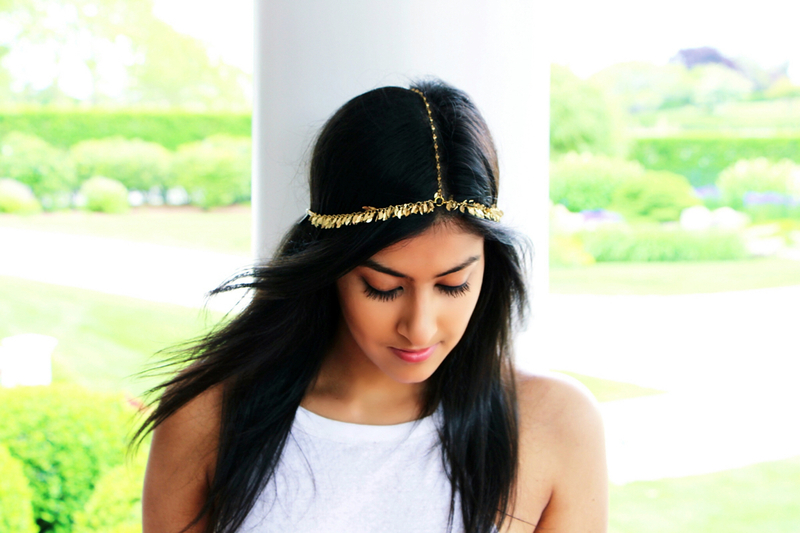 To finish off the look, I kept my accessories limited to a few rings to direct focus onto my Indian-inspired, delicate headchain. Emulate my outfit this fall and shop the pieces below. love the headpiece and the pants! great blog-just gav you a follow! Thanks so much! And thank you for stopping by my blog!